1 in 4 women. 25% of us. We will walk a path no one wants to travel. We will endure a pain no one wants to share. We will join a club no one wants to join. 1 in 4 of us will know what it’s like to lose a child. In 2009, Sophie and her husband decided they were ready to start a family. Like so many others, they don’t anticipate any problems. They don’t yet know the statistics: that a woman with a normal cycle only has a 20% chance of conceiving each month. They move forward with excitement for this next stage in their lives. Almost a year later, Sophie finds herself planning and preparing for the arrival of a son. After not feeling well for a week, she begins to have complications. The baby they’ve longed and hoped for will not be leaving the hospital in their arms, only in their hearts. 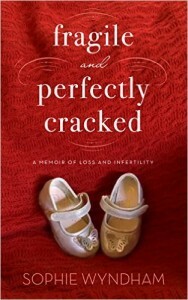 What follows is another try, another loss, then Sophie’s account of her journey through infertility treatments. It is a raw, graphic, no holds barred view of what she endured. Having traveled the same path as Sophie, it’s VERY hard for me to be objective. The fact that she’s willing to open the pain of these moments and share with the world is highly commendable. Sophie doesn’t sugar coat what she endured. It’s a recommended read, but readers should be prepared for graphic details. There are unhappy parts to any journey through loss and infertility, and Sophie doesn’t hold back. If there’s one critique I can add, it’s that I wish it was longer. I think opening up further could help the 75% better understand how to support a friend who might be experiencing infertility or loss. Adding in what helped her cope best through those losses, particularly with outside support would allow a non-member of the club some insight into helping. Overall, that’s a really small complaint in sight of the memoir. Thank you, Sophie, for sharing your hurt. I’m sorry you had to join this club. Robin Gwaro is the Young Adult and Women’s Literature Editor at Bookgateway.com. She currently spends her days wrangling her 8 year old science nerd and 10 month old busy body. You can visit her world of randomness at justwanderingnotlost.net, where there is no spoon.